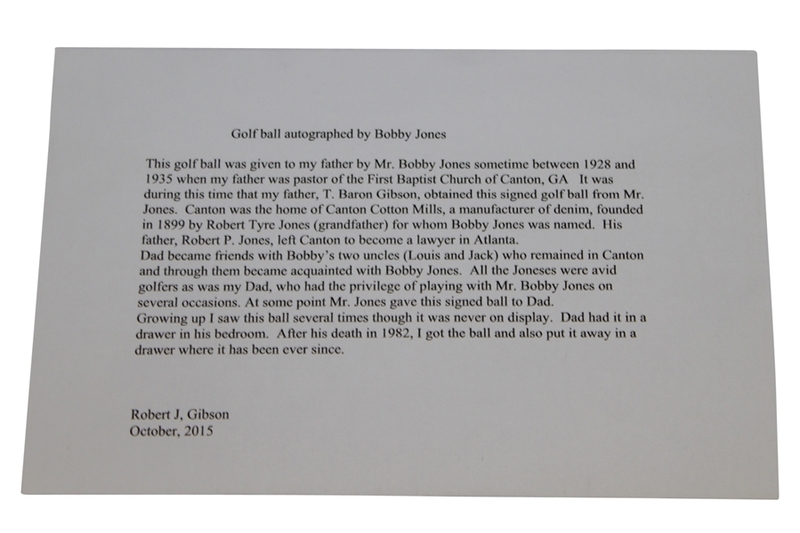 Collectors advancing into the thinner air of single signed golf balls of early legends of the links, and to be more specific in this case the greatest of them all Robert "Bobby" Tyre Jones Jr., with penning attained at the height of a career, must give this opportunity concerted attention. 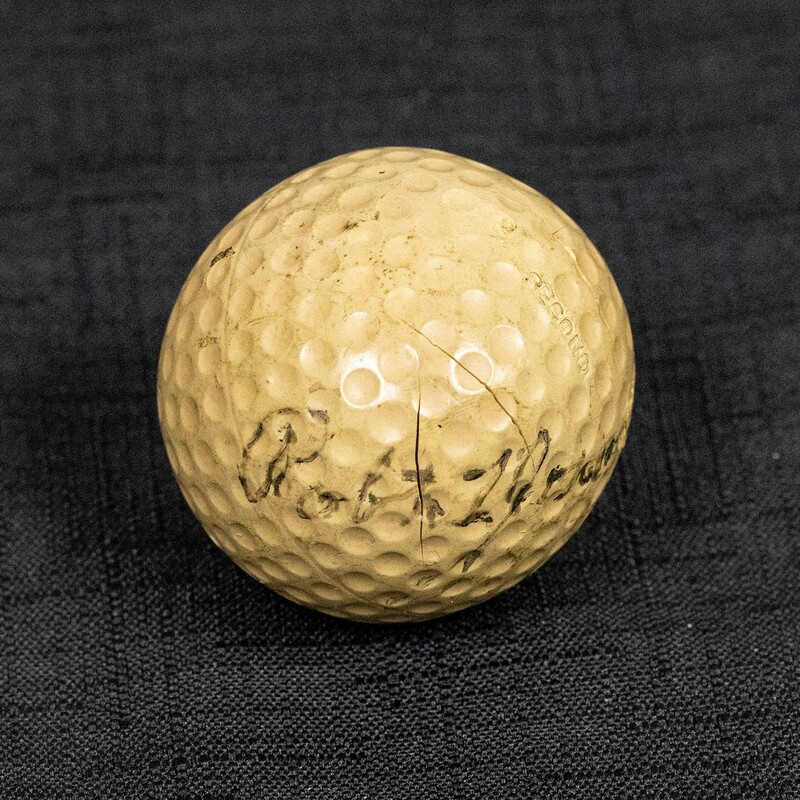 It has long been recognized by the devoted collectors of signed golf balls that there is a real scarcity of Bobby Jones signed golf balls which remain in 2019 or for that matter ever existed. Now lets go one step forward to examine what causes this real stratospheric level of scarcity. 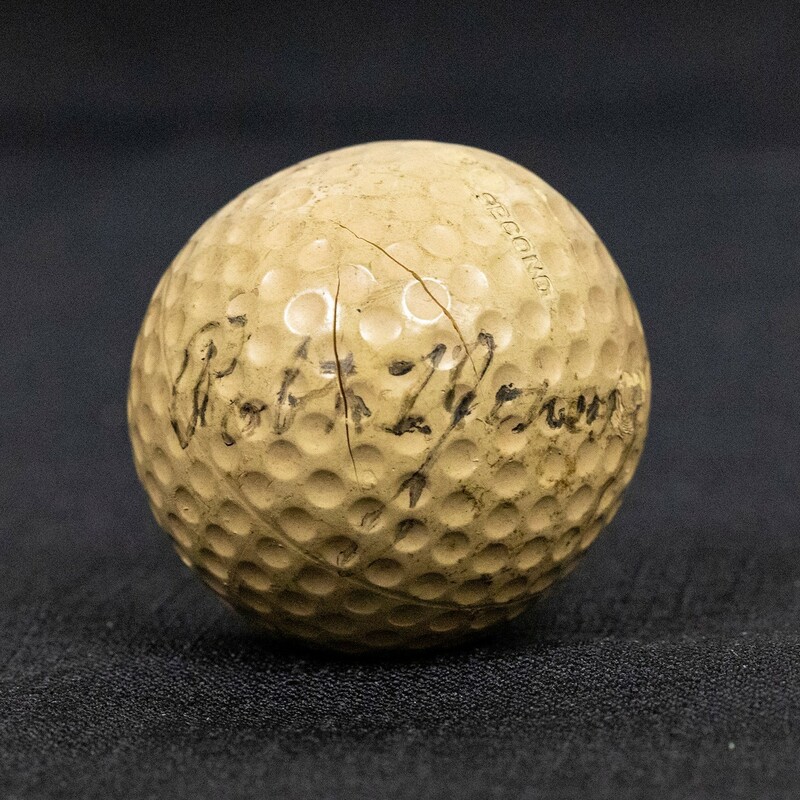 Since the surface of a golf ball is very slick, it doesn't take well to ink, and lets face it who was walking around in the Depression Era with a golf ball to be signed even if you were fortunate enough to be in Mr. Jones company. Accordingly so there have only been a handful of signed Jones golf balls that have surfaced, after extensive research only six in total can be documented, with a seventh purported to be in a cornerstone time capsule at New York's Bloomingdale's department store along with a Babe Ruth signed baseball since April 23, 1930. 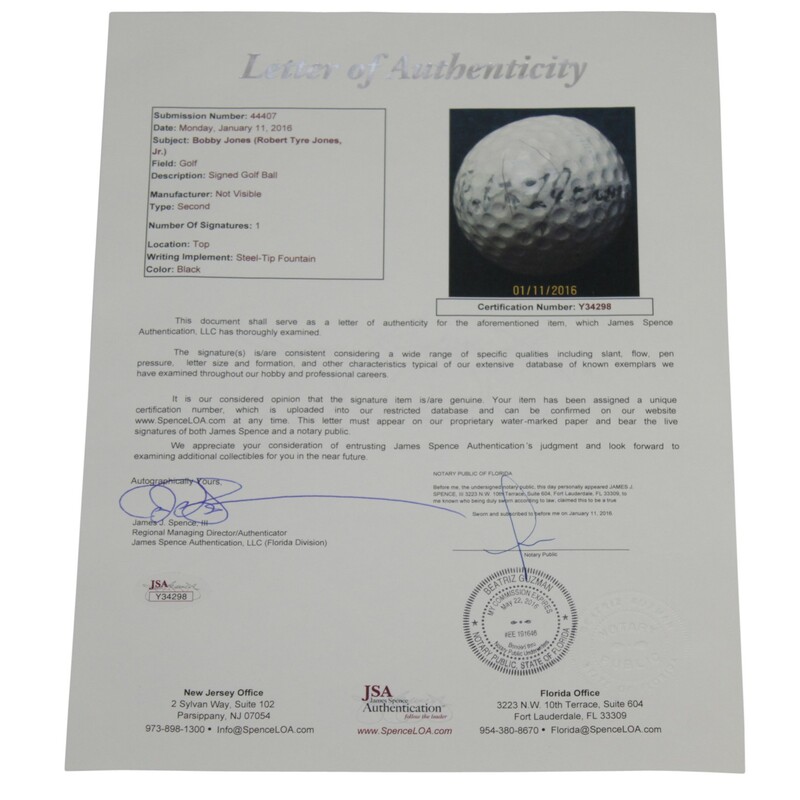 With these few signed treasured orbs know, it is easy to see why this is one of the most exciting golf artifacts to reach the auction block. The ball we offer here to this day remains in a remarkable readable condition. Jones has inscribed the ball (manufacturer unknown) in black fountain pen ink " Robert T. Jones Jr." A comparable signed item relating to popularity among collectors would be a single-signed Babe Ruth ball, though there is no comparison in terms of rarity, as Ruth signed literally thousands of baseballs during his lifetime. Golf balls, understandably, have always been far less popular for signing, especially long ago before the modern era of collecting. 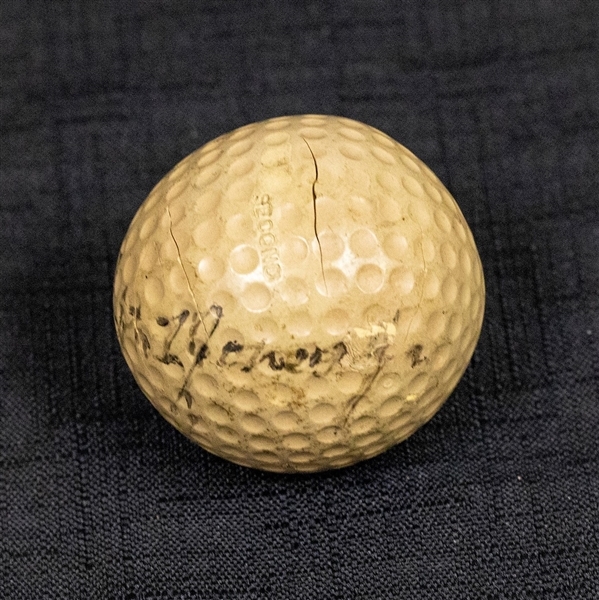 A golf ball may be one of the most difficult surfaces upon which to script one's name; however, Jones' penmanship looks quite natural upon the small sphere. 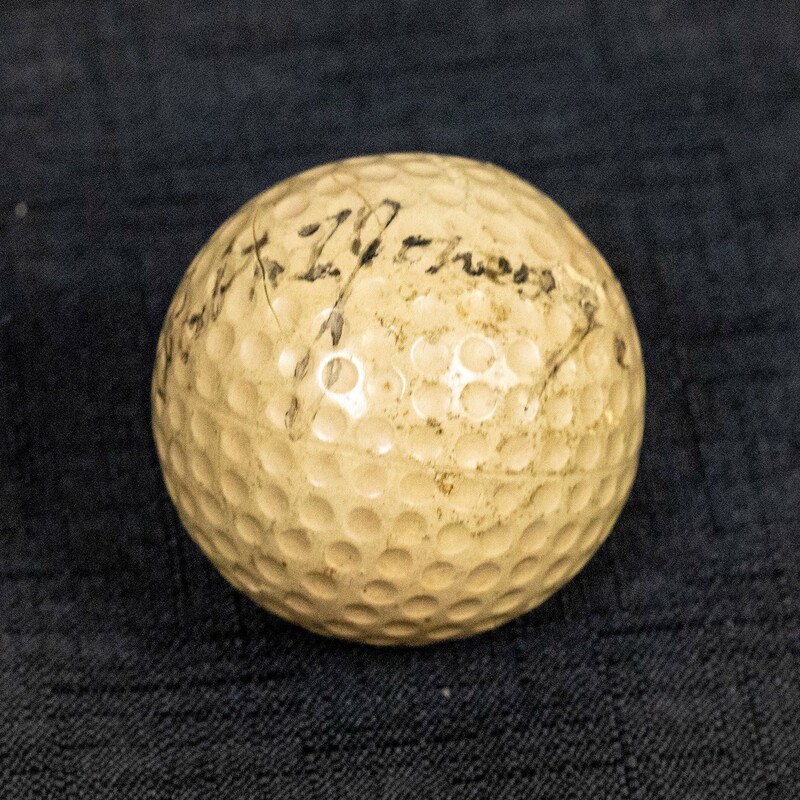 Jones, of course, was one of the greatest golfers ever to set foot upon the links and in 1930 he accomplished one of the most amazing feats in sports history by winning all four "majors" in one season (the U.S. Open, U.S. Amateur, British Open and British Amateur). 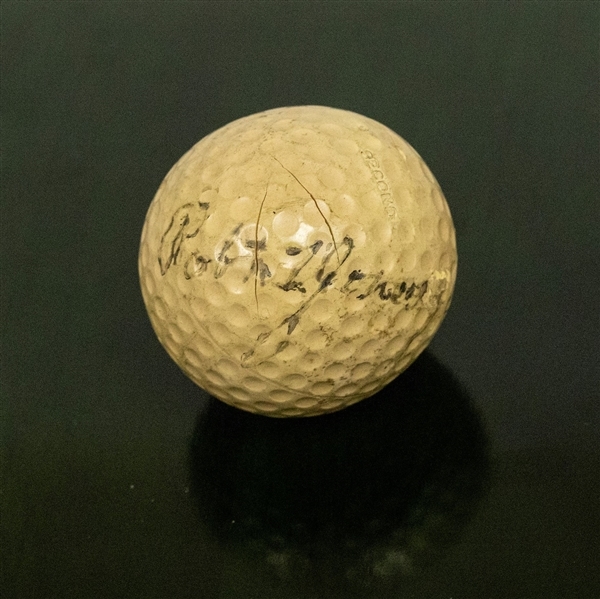 While his accomplishments, which include thirteen "major" championships over the course of seven years (1923-30), speak for themselves, his legendary status is due equally to the unusual circumstances of his career. Jones played golf more for the love of the sport rather than the accolades or money. In fact, he often only played a few months out of the year. Even more shocking was his decision to retire at the age of 28, while he was still at the peak of his career. Following his retirement he produced instructional videos and helped found both the Augusta National and the prestigious Masters Tournament. 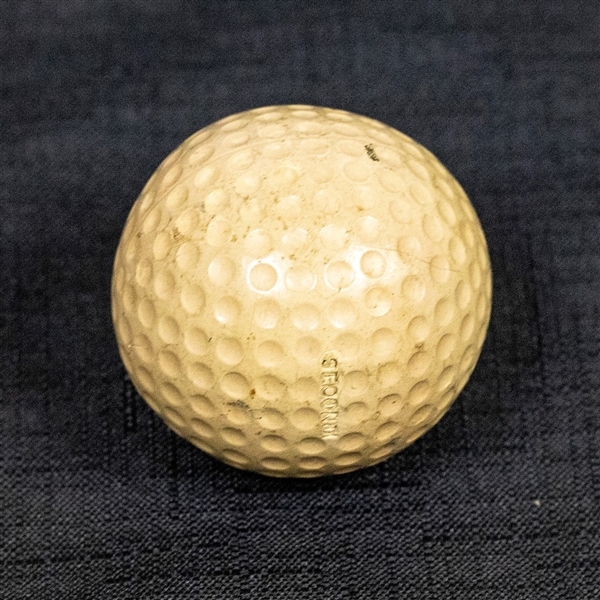 The ball is lightly soiled and displays minor crazing. Very Good condition overall. Letter of Authenticity from James Spence/JSA .The previous few authentic examples of this treasure that have surfaced have been almost exclusively signed in the latter part of Jones' life simply formed as Bob Jones. 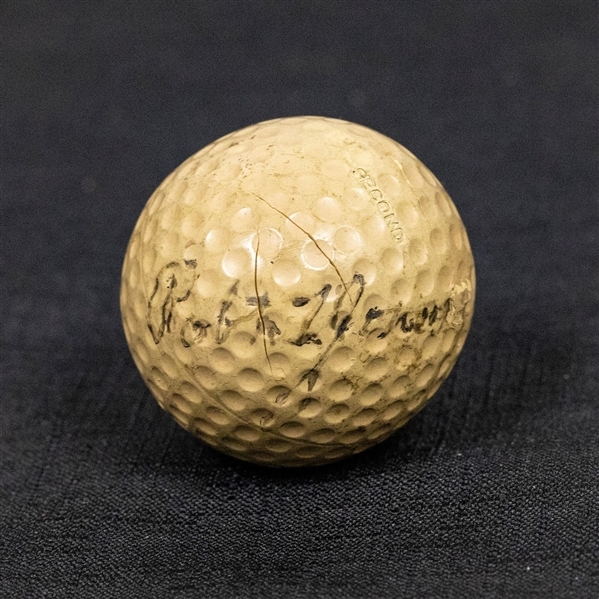 However, the autograph on the ball presented here unquestionably dates to the 1930's or earlier with Robert T. Jones in formal penmanship, making it far more desirable and historically significant. Each auction we conduct offers Bobby Jones autographs that appear on items such as scraps of paper, tickets, programs and government postcards, but until now never a golf ball. So what is something this rare worth to a collector? Previously the highest price on record is $55,585, for the seldom seen ball signed by Jones. In listening to the valued appraiser of sports memorabilia, Leila Dunbar's opinion in a New York Times article of August 21, 2017 regarding the signed Bobby Jones ball in the cornerstone of Bloomingdale's the value is "$100,000". Enjoy this Holy Grail of Sports collecting!